Apple has recently hired John Fenwick and Michael Trela, two Google satellite executives, reports Bloomberg. Fenwick led Google's spacecraft operations, while Trela was head of satellite engineering. Both Trela and Fenwick are reporting to Greg Duffy, the former co-founder of camera company Dropcam. What the two are doing at Apple is unclear, but Bloomberg speculates they're either working on satellites for image collection or satellites for communications. Rumors have suggested Apple is using a fleet of drones to collect data to improve Apple Maps, with the company having filed for an FAA permit to be able to fly drones for commercial purposes. Apple also acquired Aether Industries in 2015, a previously unknown purchase. Aether Industries develops high-bandwidth radio transceivers and high-altitude balloons. 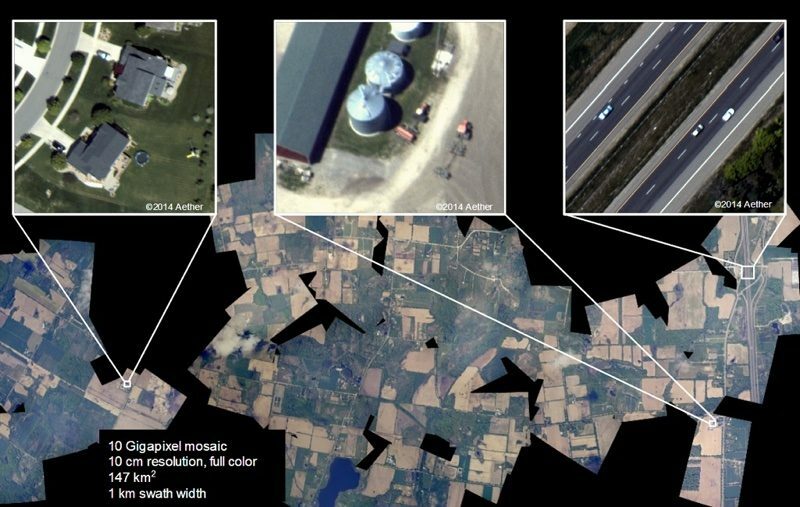 On its website, Aether Industries shows off a range of high-resolution aerial imagery and claims to provide a "full imaging and mapping solution for full color aerial images." There's also evidence Apple is interested in deploying satellites for communication purposes. Boeing has been working on sending more than 1,000 satellites into low-earth orbit for the purpose of providing broadband access, and the company has reportedly been in talks with Apple. The aerospace company has talked with Apple about the technology company being an investor-partner in the project, a person familiar with the situation said. It's unclear if those talks will result in a deal. At the annual Satellite 2017 conference in Washington D.C. last month, industry insiders said Boeing's project was being funded by Apple, Tim Farrar, a satellite and telecom consultant at TMF Associates Inc., wrote in a recent blog. A Boeing spokesman declined to comment. Former Boeing executive James Bell also joined Apple's board of directors back in October of 2015, another potential link between Apple and Boeing. It continues to be unclear if Apple will get involved with Boeing's broadband endeavor, but it's easy to see why Apple might be interested with Boeing aiming for faster speeds than existing cellular systems. Apple and Google declined to comment on the hiring, while Fenwick, Trela, and Duffy did not respond to Bloomberg's request for comments. satellite internet please. get rid of carriers and get rid of the complexity of using my iphone in a new country. My guess it's related to car communication. Would love it if Apple became an ISP. We could cut out all of these companies that are monopolizing and manipulating our laws so they can sell our privacy without our permission. Apple would make a great set of dumb pipes, but it's probably going to cost us. I'd be willing to pay as anything they devise would likely be fast and secure. Satellites though? That sounds like a big challenge. It won't get better. There is a literal bandwidth limit to satellite communications. Yup, latency. Am on wildblue satellite internet and while better, you are still a slave to physics it's all in the distance. That's why I'm always interested in any lower altitude ideas. I'm surprised Apple just doesn't straight-up build it's own ISP service. They really need to cut out the middle-man, especially with net-neutrality gone. It's expensive, but Apple is one of the few companies that can do it. [doublepost=1492799150][/doublepost]Also, satellite internet is really slow, and should only be used for emergency communications. The bandwidth just isn't there, even with a thousand low-earth satellites. Boeing/Apple would be a good partnership. They are both leaders in their fields. The current "slow" technology will NEVER get better until time is spent refining and polishing it. Or by some new technology that emerges by design or accident and becomes a game changer. Under Tim Cook, Apple has consistently tried to become more like Google. Maps, ads, experimental projects, world comms. Wouldn't be surprised if Apple got into search engines soon. Yep, current satellite latency is why companies continue to lay underwater cables all around the globe. Even at light speed (186,000 miles per second), a few 22,000 mile geosynchronous orbit satellite hops (each way!) add up. It's a lot faster to use a fiber cable at sea level (and below) to go around the world, where the max distance is closer to half the earth's circumference, or roughly a mere 12,000 miles.